Matthew Werner (left) will assume the role of managing director, investments. James Edwards (right) will be managing director, investments and portfolio manager, equities. Both will join Emory on July 1. 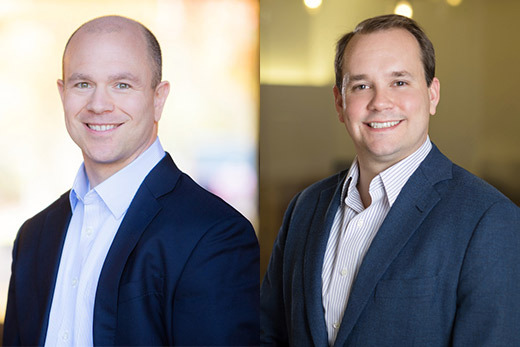 Emory Investment Management (EIM) has named two new managing directors to its team of investment managers responsible for the asset allocation, investment management and oversight of the university’s $6.9 billion endowment. James Edwards will assume the role of managing director, investments and portfolio manager, equities. Matthew Werner will be managing director, investments. Both will join Emory on July 1. Edwards is joining Emory from UCLA Investment Company in Los Angeles, where he is currently an investment director and has been involved in all aspects of managing the UCLA Foundation’s endowment portfolio. He also has a decade of experience in financial services, including roles in public accounting and equity research. Prior to UCLA, Edwards was a manager at PricewaterhouseCoopers, where he performed consulting engagements for global technology, media and telecommunications clients. A certified public accountant and a chartered alternative investment analyst, Edwards holds a bachelor’s degree in public finance and a master’s in accounting from Indiana University, as well as an MBA from the Anderson School of Management at UCLA, where he was a Student Investment Fund Fellow. Werner comes to Emory from Spider Management Company, the investment office for the University of Richmond in Virginia, where he has served since 2005. Currently Werner is director of credit, multi-strategy and emerging markets. Prior to that he was a consultant at Barra, a financial market analytics provider. Werner holds a bachelor’s degree in finance from The Pennsylvania State University and an MBA from the University of Richmond’s Robins School of Business.